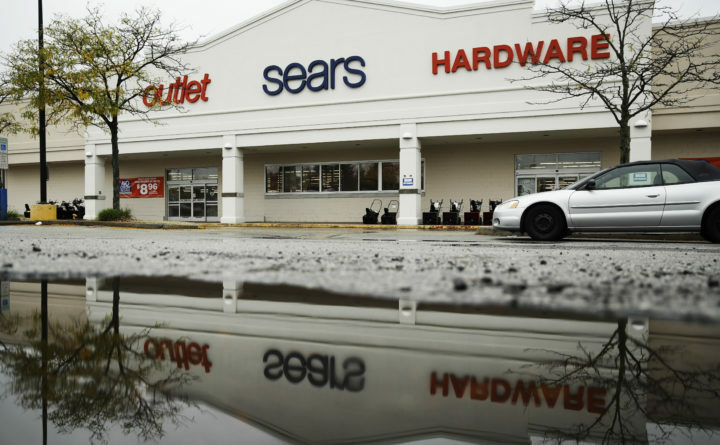 A Sears department store is seen Monday in Norristown, Pennsylvania. Sears filed for Chapter 11 bankruptcy protection Monday, buckling under its massive debt load and staggering losses. There was only one plausible outcome in the long, tortured saga of Sears Holdings Corp., and it has finally arrived. The retailing giant, which includes its eponymous department store and the Kmart discount chain, said Monday it has filed for Chapter 11 bankruptcy. It it set to close 142 unprofitable stores near the end of the year and Eddie Lampert, the financier who is its largest shareholder, is stepping down from his role as CEO. The company — formed by Lampert in a 2005 merger of two storied but struggling shopping empires — had been withering practically since its inception. Lampert’s corporate creation has never posted annual comparable sales growth. The last time it delivered a yearly profit, Borders bookstore was still in business. But rival retailers from a variety of categories should see this moment for what it is: It is Sears’s last gasp. And so, even though it’s not closing its entire fleet of Sears and Kmart stores right now, competitors should be positioning themselves to chase after the market share these chains are leaving up for grabs. For all its years of decay, Sears still commands a hefty annual sales haul. In fiscal 2017, its revenue was $16.7 billion, including $13.4 billion in merchandise sales. For context, that is in the ballpark of healthier companies such as Gap, which had $15.9 billion in revenue last year, or Nordstrom, which had $15.5 billion. So its fall presents a greater opportunity for competitors than you might think. Investors seem to be hopeful that J.C. Penney will also get some of Sears’s leftovers. Its shares shot up on Wednesday on the news that Sears was preparing for bankruptcy, even amid a sell-off in the broader market. But I don’t think they should get too excited. Remember, J.C. Penney has been more deliberate than any other retailer in recent years about trying to win market share as Sears closed hundreds of stores. This was a major part of the rationale of J.C. Penney’s move to get into the appliance business. And yet, it doesn’t seem to have done a great deal to turn the tide at J.C. Penney. The company’s comparable sales growth is spotty, and it still seems to be figuring out how to incorporate this lower-margin product category into its business in a healthy way. If this strategy hasn’t given J.C. Penney a jolt yet, I don’t know why it would now, especially as a bunch of stronger retailers join the fray for Sears’s scraps. Also, for clues on who will succeed in snaring Sears and Kmart shoppers, we should keep an eye on which industry players do a good job this holiday season of stepping into the Toys “R” Us void. Walmart, Target, Kohl’s and Amazon.com are all trying. If any of them stumble when this market share is being all but donated to them, that might suggest they’ll also have a tough time stealing Kmart’s home goods sales or Sears’s apparel sales. Before rival retailers reap the rewards of Sears’s flop, they may yet have to endure some short-term pain. As some Sears stores hold liquidation sales that have rock-bottom prices on big-ticket items, some shoppers may flock to those in the weeks to come. And some retailers may feel a drag from being co-tenants with soon-to-be-vacant Sears or Kmart stores. But overall, the bankruptcy leaves the retail world with a bounty of low-hanging fruit.